Similar in properties to ginseng, Cordyceps is the supplement that was used in the early 1990s to propel the Chinese women’s track and field team to breaking several records. Like reishi and shiitake mushrooms, cordyceps sinensis is becoming an increasingly popular fungi supplement in the Western world. In China, cordyceps was used to enhance the glandular system. It also enables the body’s strength and endurance building capabilities, benefits kidney function and circulatory system, and supports the upper respiratory tract. 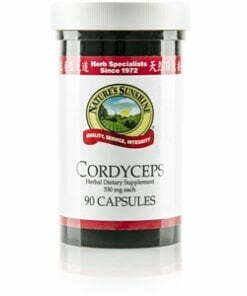 Each Nature’s Sunshine Cordyceps capsule is 900 mg. 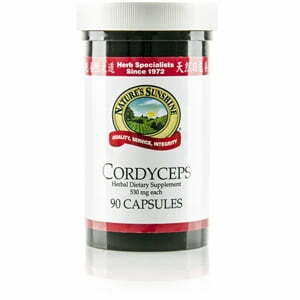 CAUTION: Cordyceps, a safe supplement for adults, should not be used in conjunction with immune-suppressing drugs, anticoagulant drugs, or bronchodilators unless given the permission of a health care practitioner. Additionally, pregnant or breastfeeding women should not use cordyceps. Store in a cool, dry place. Instructions: Take two or three capsules with a meal three times daily. Store in a cool, dry place.